You may have been asking yourself where you should start planning this very elaborate task but have no fear. Here are some key tips for when you should start planning your wedding and what you should do. Work on your budget before doing anything else. This will give you a better chance to be in control of all your expenses. Certain wedding suppliers like wedding planners, wedding venues and wedding photographers should preferably be booked about a year before your wedding. You can then get to know all of your suppliers so that you could become more comfortable with them. 1. Limit the number of bridesmaids and groomsmen. You’ll cut down on how many bouquets, boutonnieres, and attendants’ gifts you have to buy. 2. Plan early, make lists and keep good records, by writing everything down, you’ll know exactly how much you have spent and how much you still need. 3. Avoid high seasons. People prefer to get married during summer, or on special days like valentines day. Avoid such seasons and dates, as the cost of all wedding related services shoot up during such periods. 4. If your wedding is a year or more ahead, start purchasing items as you have extra cash to splurge. 5. Set your wedding budget for each item. As much as you want to have that special fairy tale wedding, be realistic and price out what you can afford. 6. Ceremony location fee. If you’re not getting married in a traditional religious setting. You own backyard, village hall or park setting can be just as romantic and cost less. 7. Book a venue that’s already decorated, like a garden, aquarium or museum. You won’t need to pay for price. 8. Cut your guest list! This will save in many areas ; from caterers to favours – just invite those who mean the most to you. 9. Ceremony programs are not always needed, some couples do without. However, if yo want to use a ceremony program, print your own or have a calligrapher just design the cover and print and attach the interior pages yourself. 10. Look into print your own invitations. Many companies sell complete DIY invitation kits at a fraction of the cost. 11. Keep it to one card. If you can fit all of your reception information on the wedding invitation, you’ll save on the materials and printing costs, and possibly even on the postage. 12. Turn your reply cards into postcards. Printing RSVP info on one side, and the return address on the other. You’ll save money on return postage and envelopes. 13. Coloured ink and lined envelopes can add significantly to your invitation budget. Black ink on a simple white or cream invitation can look simple, elegant and classy. 15. Look for your dress at designer sample sales, trunk shows. 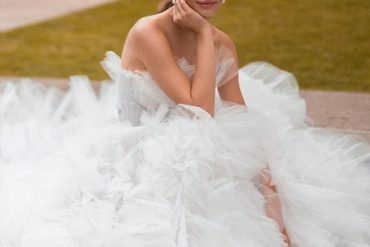 Checking out vintage bridal shops, consignment stores and sample sales may also provide you with an inexpensive solution. 16. Consider wearing your mother’s gown. This costs of cleaning and alterations will be much cheaper than purchasing a new one. 17. Accessory and comparison shop online. Chances are you’ll snag a good deal. 18. Order a small, tiered cake that makes a statement. Then serve up slices from a sheet cake that’s identical in flavour and frosting. 19. Consider breakfast, wedding picnic, afternoon tea. They are shorter in length and the fare is lighter and less expensive. 20. Use expensive ingredients such as lobster and shrimp for hors d’oeuvres, rather than in the main course. 21. Look in to seasonal dishes. Ordering dishes that use ingredients which are in season not only will save your money, but also will be fresher and taste better too. 22. How dinner is served affects the price. French dinner and regular plate service are the most expensive option.s Offer family style dishes or a buffet style dinner to save on costs. 23. Limit alcohol choices to wine and beer, both of which will satisfy most guests. Limit champagne to just the initial bride and groom toast. 24. Consider a signature drink or create speciality drink and serve that instead of having an open bar. The cost of having a full bar can be quite costly. 25. Skip the full bar. Instead, serve just wine, beer, soda, and one popular cocktail (it’s hard to turn down a margarita). 26. Instead of purchasing the wine through your reception hall or caterer, consider purchasing wine wholesale. If you decide to purchase your own wine, discuss with the caterer how much their corkage fee is. 27. Look into making your own simple favours using candles, chocolate,herb pot even a simple fragrant flower. 28. Talented Family and friends involved – make cookies or edible treats. 29. Skip the fancy packaging. Wrap your favours simply and elegantly with tulle, organza or white on white gift wrap. 30. Wedding favours can become expensive, so avoid purchasing wedding favours that have a wedding theme to them. 31. 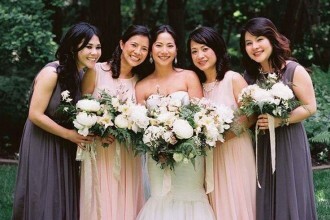 While most popular bridal flowers are available year round, some are seasonal. Talk with your florist on cost saving in season options. 32. Single pillar candles or an arrangement of votives casts a calm, peaceful feeling on tables. Check with your reception venue first through some ordinances do not allow burning candles for fire safety purpose. 33. Flowering bulb in a clear hurricane vase with stones in can provide for an elegant centrepiece. This is somthing you can DIY with a bit of pre planning. 34. When hiring a limousine company check local newspapers. Ask if they have any wedding packages. Some companies may offer cheaper rates during off peak season and on Sundays. 35. Rather than hiring separate musicians for the ceremony and reception, see if they can accommodate both. Check out local cover bands. Although not your typical wedding band, cover bands usually do cover songs, and may perform just as well as a more expensive traditional wedding band. 36. Rather than hiring a band, harpist or string quartet to play at your ceremony. 37. Choose a photography package rather than purchasing separately. Place disposable wedding cameras on your reception tables rather than having the photographer take pictures at every table. 39. Use a honeymoon registry – A honeymoon registry operates much like a gift registry. Guests can find the link to your honeymoon registry in their bridal shower invitation or on your wedding blog or website, and they can gift you money toward your honeymoon.